I've been busy training with my local council again and this time it's about writing care plans with social services - I thought that would be really helpful for our wee Carer group! Coo's been really tired this week and hasn't wanted to go out much at all, I think it's just the after Christmas lull most people experience in January but I'll keep an eye on things just in case. Good, infact brilliant news...meet Jessica! Our much awaited first grand-baby has finally arrived! Woo Hoo! 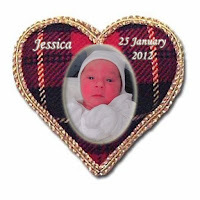 She's pictured in a tartan heart because, being born on the 25th of January makes her a Burns baby! Coo and I are tickled pink at being grand-parents - can you tell! I hope things are good where you are too!